Nkasi District Council was established in 1983 and given a certificate No. 17429/12 after a series of landmarks that led to the enacting of a Local government. 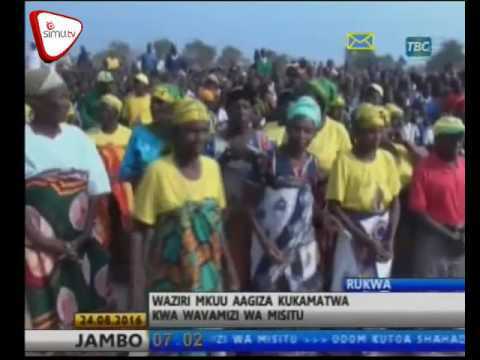 It is one of the four District councils comprising the Rukwa region. Nkasi District Council profile provides information on the basic information of the District in all areas. The Council’s service delivery is guided by National development goals which are in line with millennium development goals. The Council’s Vision Statement aims at “Seeing its community receiving high quality services and improved sustainable livelihood”. “Nkasi District Council, in collaboration with various stakeholders, intends to provide satisfying and high quality services through adherence to good governance and priorities set by the community in relation to available resources by year 2020”. Nkasi district is among three districts of Rukwa Region. It is located on the South West Part of Tanzania between Lake Tanganyika and Lake Rukwa and lies between longitude 30o 20’-31o 30’ East and Latitude 6o 58’-8o 17” South. The major and unique characteristic of the District is its long shore of Lake Tanganyika, which lies in the district covering almost 186 kilometers from Kalila village situated in the far north to Kilambo cha Mkolechi village in the south. The District has two Agro-economic zones namely; the Fipa Plateau and the Lake Tanganyika Shore. The Fipa plateau, which covers about 75% of the district’s total land area, lies between altitudes 1,250 metres and 2,200 metres above sea level and the plateau is covered with open grassland that occupies 42% of the District area, and Miombo woodland which occupies 50%. The Fipa Plateau experiences rainy season from November to April, and dry season from May to October. The climate is generally cool during rainy season and warmer during dry season. The Lake Tanganyika shore including its escarpments covers about 25% of the total land area and lies between altitudes 700 metres to 1,600 meters above sea level. This zone experiences varying rainy and dry seasons due to the effect of winds. The climate is warm throughout the year and rainfalls range from 750 millimetres to1, 200 millimetres per annum. Lake Tanganyika shore is covered with coastline forests and woodland vegetation. Nkasi District has a dry savanna type of climate which is characterized by long seasons lasting between late April to early December and short single wet season during the remaining months. The climate is normally warm throughout a year. Table I below summarizes Agro-economic zones characteristic in the District. Very gentle plain with moderately slopping hills and gentle plateaus. Maize, beans, cassava, groundnuts, millets, sunflowers. Steep hills with gentle plateaus and plains. Shallow sand loams with scattered clayey. The District occupies an area of 13,124 square kilometers of which; 9,375 square kilometers are covered by land and 3,749 square kilometers are water bodies. The District is bordered by Sumbawanga rural and Kalambo districts in the south, and in the north side the District is bordered by Katavi region, and the Democratic Republic of Congo is situated in the west side of the District. Administratively, the District is divided into 5 divisions namely, Namanyere, Kate, Chala, Kirando, and Wampembe-these last two divisions are situated along Lake Tanganyika shoreline; 28 wards, namely Namanyere, Itete, Mashete, Isale Asilia, Mkinga, Kizumbi, Paramawe, Majengo, Isunta, Ntatumbila, Kipundu, Nkomolo, Isale, Kate, Sintali, Kipande, Nkandasi, Mkwamba, Chala, Mtenga, Kabwe, Korongwe, Kirando, Kipili, Ninde, Wampembe, and Kala-the last seven wards are composed in the divisions situated along Lake Tanganyika shoreline. The District has a total of 93 registered villages and 762 sub-villages. The District is also divided into two constitutional areas commonly known as Nkasi North and Nkasi South. At ward level there is a Ward Development Committee which is led by a Chairperson who is normally an honorable member of the District council; and at village level the Village Council is led by an elected Chairperson. The District Council has a total of 1,997 employed civil servants working in various departments providing social and economic services to the community. These departments are; Administration & personnel, Health, Primary Education, Secondary Education, Works and Fire brigade, Land and Natural resources, Agriculture/irrigation and cooperatives , Community development and social welfare, Finance and Trade, Planning, Statistics & Supervision, Water and Environment sanitation, Livestock & Fishing. The community is also benefiting from services provided by judiciary courts, police forces, prisons, defiance forces, and the other non-governmental organizations working in the District. The dominant ethnic group which is native to the District is Fipa. Other ethnic groups include Sukuma, Nyiha, Nyakyusa, Ha, Bende and Kinga. According to the Population and Household Census (2012), Nkasi District Council has a total population of 281,200 people out of which; 137,041 are males and 144,159 are females. The population growth rate is at 3.0% and household volume is 5 people per household. Nkasi District has various institutions working in the district to ensure efficient provision of needed services to the community. There are present religious institutions that include Christian churches and monasteries, Islamic mosques, education institutions ranging from primary, secondary schools, to vocational training centres, financial institutions, Medical services and Community welfare institutions, National security institutions and other non-government organizations. All these institutions collaborate to make sure that District council’s vision and mission are attained as determined. According DED-Nkasi District: Policy, Planning, Monitoring and Statistics office (2014), the District has a number of development stakeholders who work in conjunction with the District council to bring about favorable environment for social and economic progress to the community especially the rural poor. Major development stakeholders in the District are described below together with their expected obligations and possible repercussions that could happen if these expected obligations are not met responsibly. Councils of Village Government. These councils have expected responsibilities of ensuring provision of technical advices on the management of village governments and interpretation of various policies, laws and regulations flowing down from the Central government. But if these could not be met, the result is eruption of public complaints on the government and there will appear poor performance by village government civil servants and other elected leaders. Councils of the village governments are normally ranked medium as development stakeholders. Non-Government Organization. Provision of statistical information on the district, ward and village government; laying strategic and operational plans and socio-economic data. Their second responsibility is provision of conducive social and political environmental to enable NGOS to work collaborate peacefully with LCG as important development stakeholder. Poor performance on this could result into inadequate Non-government organizations support to the District council’s and Village governments initiatives and Disangageme4nt of NGOS from supporting the community Development initiatives. Non-Government Organizations are normally ranked high. Central Government. This is another very important development stakeholder in the District as has a role of enacting various laws and policies together with their interpretation. Formulation of programmes, guidelines and regulations essential for assisting local government authorities working at district level. Again, if this could not be fulfilled responsibly the result is problems associated with budget authorization and Central government fund release problems. Donor Community. The Donor community has an obligation of making sure that District’s socio-economic profiles and development plans are well prepared to suit requirements and also making sure that funds requested are released timely and expenditures are proper and reports are prepared and presented on time. Failure to this could render Donors difficulties in releasing approved funds requested for implementation if various development undertakings. Donor community is ranked high as a District’s development stakeholder. Nkasi Community. Provision of information on approved annual plans and budgets and socio-economic services; failure to fulfill this could result into the community complaints towards the District council performances in the provision of services. Nkasi community is ranked medium as a District’s stakeholder in development. Namanyere Designation District Hospital (NDDH). Provide technical assistance and advice on health services and has basket fund approved in annual budgets that enable implementation of various medical activities. By virtue of fact, the hospital is there in place to ensure sound health of the community so that it could be able to engage efficiently in development activities. If this could not be fulfilled it can result into poor delivery of medical services to the community and hence ill health. Namanyere Designation District Hospital is ranked high as a District’s development stakeholder. National Micro-Finance Bank (NMB). Major responsibility expected from this important development stakeholder is provision of proper information on various District council’s accounts and also conduct financial businesses with customers. Failure to fulfill this could result into immense deterioration of financial stability in the District and hence economic fall down. National Micro-Finance Bank is ranked medium as a development stakeholder in the District. Prime Minister’s office, Regional Administration and Local Government Authorities (PMO-RLGA). District council to pursue rule of law in accordance with Government’s policies and guidelines. Plan based on issued policies, guidelines and directives, effective two-way type of communication. PMO-RLGA interprets policies; formulate programmes, guidelines and regulations to the lower level of government authorities. The impact on failure to fulfill this is late flow of required information and budgets authorization problems accompanied by late release of funds from TAMISEMI. Prime Minister’s office, Regional Administration and Local Government Authorities (PMO-RLGA) in its all expected responsibilities is ranked high as District’s development stakeholder. Neighboring District Councils. Good neighborhood by holding joint forums/task forces and share experiences in implementation of planned interventions for sustainable development, peace and tranquility, and respect to share boundaries. Also, joint responsibility in preserving shared resources like rivers, lakes, etc. failure to do this will result into total dependence on the Central government for financing, communication barriers and underdevelopment of infrastructures; and also there may appear lack of efficient coexistence by some authorities. Political Parties. These harmonize different political ideologies otherwise difference in priorities between political parties may occur. Political parties rank at medium as District’s development stakeholder. Religious institutions. These institutions rank at medium level as development stakeholders in the District. Their expected responsibility is for peace and harmonization which is very important to be engaged in self-reliance activities that will help to reduce poverty and therefore bring changes in ethics and development. 1.8 Strength, Weaknesses, Opportunities and Challenges Analysis. Nkasi District Council has strength and weaknesses it faces in the process of development. This SWOC analysis is used as a tool during implementation of strategies and planned programmes to achieve set objectives and targets. Tables below describe strength and weaknesses and also opportunities and common challenges that normally impair smooth implementation of development activities. 1. The District council was established by virtue of the Union constitution (145 and 146) and the Act of Parliament Section No. 7 of 1982 section 111. 2. It has a close development partnership with the central government and various donors e.g., JICA, AFRICARE, JPIENGO, ADB, World Bank. 4. It has a strong government system that spreads out to the village and hamlet levels. 5. The District has established by-laws at district and village levels. 6. It has staffs who work as a team. 7. It receives and implements policies, guideline, rules and regulations from Central government. 9. Experienced in plans preparation. 10. It has the experience of working with NGOs and donors. 11. Received clean External Audit certificate from NAO for the past two years. 1. Shortage of staff in all sectors. 2. Some staff members have inadequate skills for their respective posts. 3. Underdeveloped communication infrastructure and network. 4. Inefficient data collection system to meet the council requirements. 5. Presence of poor motivation to staff members. The District council together with strength and weaknesses discussed above it also have many opportunities which if utilized properly could help in attaining desired development; but besides available opportunities there are also challenges that affect implementation of development activities. The table below explains some key opportunities and challenges experienced by the District council. 1. Conducive climate which supports agriculture and livestock industry. 2. Fertile soils suitable for production of a variety of crops. 5. Presence of a tarmac road from Tunduma to Mpanda which is an impetus to economic development and attraction to investors. 6. Existence of attractive places for Tourism industry e.g. hotwater springs at Kanazi village and waterfall rapids of Ntembwa river at China village, Lwafi game reserve, Chala mountain ranges, and other natural resources. 8. A long lakeshore line of Lake Tanganyika for fishing activities and tourism. 3. Breakdown occurrences of disease epidemics e.g. cholera in Lake Tanganyika coast villages. 5. High maternal and child mortality rates. 8. Environmental degradation and destruction of water sources. Nkasi District Council has key issues which are priority problems the council intends to deal with in a given period of time on order to fulfill its mission. The following are key issues the Council intends to deal with in the coming five years, which is year 2014/2015 to year 2018/2019. 1.9.1 Agriculture and Livestock Sector. Nkasi District is agricultural as more than eighty percent of its inhabitants are engaged in agriculture for their livelihood. This sector is very important as it plays a big role in ensuring food security and economic progress of people in the District. Agriculture supports the farming community in favor of a National agricultural policy known as Kilimo Kwanza, that is agriculture must be given first priority in all development programme in Tanzania. However, this sector is still lagging behind due to inadequate resources essential for supporting its development like vaccination and medication of livestock against diseases such as Foot and mouth diseases (FMD), New castle disease (NCD) in poultry, East coast fever (ECF) in cattle. Underdeveloped cooperative spirit is also an obstacle to the development of the sector. 1.9.2 Education Sector. Education is a core to the development of the District and everything is being done to make sure that this very important sector is strengthened. However, the sector is still characterized by insufficient infrastructures, facilities, personnel, and other important accessories and working gears in both pre-primary, primary, and secondary schools. Low budgets allocated by the government for the sector is another setback. The community is still backward in recognizing the importance of education something which leads to low enrolment rate and immense dropouts. The District council in collaboration with Central government and other development stakeholders strive hard to ensure alleviation of these repercussions and there is hope. 1.9.3 Health Sector. The District council work hard to ensure all people in the District have sound healthy in order to participate fully in their respective development responsibilities. New dispensaries and health centres are being built in rural areas and those already in existence are being renovated and furnished; the aim being every village to have its own dispensary. However, the sector does not lack challenges which bring obstacles to its progress; notably, poor status of health facilities and infrastructures which require making of major and minor rehabilitations, there is also inadequate qualified staff in almost every facility and dispensaries. 1.9.4 Water Sector. The water sector is not well developed in the District due to insufficient resources available to rehabilitate and conduct maintenance of the existing water supply network; but efforts are underway to ensure installation of permanent water supply system in the whole District and this is possible because the District has been endowed with many permanent natural water sources including Lake Tanganyika and rivers. 1.9.5 Road infrastructure. The roads infrastructure at present is also still poor and some of them are impassable during rain seasons as they are earth roads. An inadequate fund endowed by Central government has rendered difficulties in implementing rehabilitation and maintenance works of the roads efficiently and timely. The District council lacks local civil works contractors who have enough capital and expertise to enable them conduct works precisely. 1.9.6 Cooperative Sector. The District council in collaboration with the Government of Tanzania is encouraging formation of community cooperative groups where they can be able to access loans and other agricultural input subsidies like fertilizers and improved seeds. However, the sector is still backward as it is faced by some challenges; the major one being cooperative spirit to most people is very low due to ignorance and undesirable records of cooperative historical background in the District. 1.10.1 Hiv/Aids Pandemic. Nkasi District council is also faced by this pandemic like any other districts countrywide. This syndrome has affected manpower of the District by reducing it and hence affecting economic progress of the District. The District is striving hard to make sure that new infections are forbidden by launching massive medical education campaigns to the community and encouraging people to regularly check their health status and register for an ARV’s programmes and insisting male circumcisions. The community’s response is heartening as new infections have been checked down from 4.1%.percent in 2012 to 3.1% percent in 2014. However, many things are still to be done especially to the rural community who due to lack of adequate formal education change their attitude towards sexual conducts very slowly. 1.10.2 Environment Conservation. Nkasi District Council is facing a serious problem of environmental degradation that is caused by various misbehaviors like reckless burning of forests, illegal harvesting of forestry produce, undesirable traditional shifting cultivation and destruction of water sources. In order to overcome this problem the District has plans and strategies which include integration of the community to raise their tree seedling nurseries so that 500,000 trees seedlings could be planted every year through community participation, Non-Government Organizations, and institutions like schools and religion denominations. The District council ensures preparation of appropriate village land use plans and continuous education on environment conservation including protection of water sources. 1.10.3 Gender and Development. The District Council has put in place priorities and strategies on gender and development believing that by gender parity development and civilization could be attained. In order to achieve this massive education is continuously being launched by the Council sensitizing citizens on various issues concerning observing and ensuring equal gender recognition and participation in formulating, implementing and evaluating development plans all over the District. The changes are great as women are almost in every area or sector of development working hand to hand with men; the aim is to coup with the National gender balance of 50 to 50. 1.10.4 Corruption. The District council work together with all bureaus that are in battle to fight and hence eradicate corruption conducts in the District. The best known bureau is PCCB which corporate with the Council and other stakeholders in the District to educate the community using various methods on developing hatred towards corruption and other bribery behaviors. The trend goes well as PCCB gives information on corruption that cases have decreased from 3cases in 2012 to 1 case in 2014. 1.10.5 Poverty Eradication. In accordance with year 2010 real prices data, the District’s average income per capital or District GDP is Tshs. 600,000.00 per year and normally people earnings per day is below 1 US Dollar. Therefore, by virtue of fact the level of poverty of people in the District is still high. However, the District council in collaboration with various development stakeholders from inside and outside the District continue to struggle by all means available to make sure that by application of appropriate technologies in production people will produce more and therefore their income will raise and they will also be able to move towards a more advanced stage of development and hence poverty will remain a history. NKASI District has many and various economic sectors with activities in which people are engaged and employed in. The economic sectors in which people are engaged and employed in the District are; agriculture which employs more than 81% of the population, livestock keeping which give employment to 2% of the population, fishing industry gives 6.2%, clerical works 1.9% per cent, business activities 4.6%, and the other elementary occupations count at 3.6% of the District’s population. 2.1.1 Existing Situation. Agricultural sector is one of the most important sectors in economic development in the District. As it was stated earlier it is estimated that 81% of people in Nkasi District are engaged in Agriculture. This sector is very important and it has been discussed on the Millennium Development Goal 2025 and Tanzania Development Vision 2025 for the sake of improving the well-being of people whose principal occupation and way of life is based on Agriculture. Most of these people engaged in agriculture are small holder farmers who normally due to low capital, poor technology do not produce surplus. According to the National population and household census (2002), 45,554 farming households in Nkasi District are fully engaging themselves in agricultural activities and produce crops mainly for food security and sell surplus to ensure their income. Unfortunately, much of the agricultural potentials are not yet exploited properly so as to maximize production of different crops and therefore raise income and hence the living standard of people in the District; farming is still subsistence and it is conducted using hand hoes, oxen and few tractors available. Presence of a vast arable land and fertile soils. Nkasi District is blessed with a vast land with fertile soils that support establishment of various crops. Common crops cultivated in the District include; maize, beans and other pulses, finger millets, paddy (rice), sunflowers, groundnuts, cassava, wheat, Sweet potatoes, Round potatoes, Canes, Banana. Fruit and vegetables are also cultivated but in small holdings. Barley and sesame have been introduced in the District in recent years and adoption is increasing hastily. In general, all crops are treated as both food and cash crops. The District is estimated to have an arable land of 644,000 hectares which are not yet fully utilized as to date its only 31% of this land is under cultivation. Presence of good climatic condition. The District is characterized by having two major agro-ecological zones, which are; The Fipa plateau and Lake Tanganyika shoreline. The Fipa plateau is situated in the east of the District and it has a cool climate with sufficient rainfalls ranging from 880 millimitre to 1,200 millimitre per year and normally fall from mid-November to April. All mentioned crops do well in this zone. The Lake Tanganyika shoreline is situated along lakeshore lines stretching from Kalila village in the far north of the District to Kilambochamkolechi village in the south. The zone is characterized with soils ranging from alluvial to sand-loams suitable for production of all mentioned crops plus tropical fruits. The zone experiences monomodal type of rainfalls from mid-October ending in March. Presence of a vast land with fertile alluvial soils suitable for irrigated farming. The District boasts of having more than 3,000 hactares which are suitable for development of irrigation schemes. The Council collaborated with Zonal irrigation department to measure and draw designs at the following schemes of Lwafi/Katongolo, Namansi/Kisambala, and Kate. The Lwafi/Katongolo irrigation scheme has been completed and handed over to irrigators’ organization for operations. Strengthening of extension services to ensure that farmers use improved methods of crop production and application of modern technologies in agriculture. The Council has employed 65 agriculture extension workers who serve the purpose through farmers field schools; this is together with constructing 4 ward agricultural resource centers in Wampembe, Sintali, Kipande, Mtenga, and Kirando wards. Use of both organic and inorganic fertilizers, quality declared seeds, tractors in land cultivation. The District through DADPs has enabled smallholder farmers groups to purchase 10 large tractors and 65 powered tillers. Now, the District has a total of 34 large tractors with capacity to cultivate more than 30,000 hactares per season; not only that but also presence of these machineries has improved shelling of maize and finger millets and therefore improve quality of the grains. An average 27,000 tons of maize grains were shelled using tractor motorized shelling implements in year 2014. Improving agricultural infrastructures by rehabilitating rural roads. The rural roads with more than 40 Kilometres have been rehabilitated in Kirando, Mtenga, Namanyere, Isale, and Kate wards easing transportation of implements, inputs, and crops to and from the fields. Availability of networks and electric power in the District. There are 3 phone companies operating in the District covering almost two third of the District area; these companies are the Vodacom, Airtel, Tigo, and Zantel. Tanesco has also brought in electric power supply a thing that will stimulate development of agricultural processing industry in the District. Nkasi District is faced by many challenges that affect agriculture development. Some of the major and common challenges identified include; inadequate agriculture inputs and farming implements to support expanding agriculture, deteriorating soil fertility and environment degradation, low of capital to smallholder farmers, lack of banking facilities that deal with agriculture development, presence of poor and unreliable crop markets, presence of poor crop storage system infrastructures, poor rural roads, farmers ignorance. All these challenges are dealt with the District councils in collaboration with various development stakeholders by application of various strategic measures as described in the District agriculture development plans. People in Nkasi district are cooperative in nature and having realized that the District council through its cooperative officials and in collaboration with other development stakeholders continues to sensitize and mobilize people to unite and form potent modern and improved cooperation institutions. This task is being carried out successfully and the response of people is overwhelming. Meanwhile, the District has 17 savings and credit cooperative societies, 8 Agricultural marketing and cooperative societies, and 48 farmers groups. Livestock keeping is the 4th dominant economic activity after agriculture carried out by people. The District is rich in different livestocks; it has 187,796 cattle, 43,028 goats, 6,308 sheep, 205,479 hens, 1,352 donkeys, 1,187 hare and 16,594 ducks, 5,382 Pigs, 4,197 Pigeons and 1,761 Kanga. Number of cattle usually increases up to 200,000 during dry seasons due to immigration of cattle from neighboring Districts looking for pasture and water. To ensure that livestock sector, this to a large extent shall be commercially run, modern and sustainable. To ensure that livestock resources are developed and managed sustainably for growth and improvement of people’s livelihood. To ensure that the National livestock policy is to developed a competitive and more efficient livestock industry that contributes to the improvement of the well being of the people whose principal occupation and livelihood is based on livestock keeping. Contribute towards National food security through increased production, Processing and marketing of livestock products to meet national nutritional requirements. Improve standards of living people engaged in the livestock industry, through increased income generation gained from livestock. 6. Increase the quantity and quality of livestock and livestock products as new materials for local industry and export. Extension services deals with the transfer of knowledge from livestock experts to livestock keepers and also extension officers act as a bridge between farmers and experts and back to the experts. Another function of the extension officers is to disseminate new technology from Research Centers to farmers. Contribution to individual and National Income. The policy statement points out that the livestock sector should contribute to individual and national income. Individual income improves living standards of household as a whole, while the National income contributes to the national earning and foreign exchange. Many livestock farmers live under the poverty line. In order to have enough feed for livestock aiming to ensure high productivity to livestock, there should be an improved range land as little feed results into less productivity. The statement policy stresses that in order to get the productive animals deliberate improvement should be done including cross-breeding between our indigenous Short horns Zebu with Exotic breeds either naturally or through Artificial insemination. This ensures obtaining of cross-bred offsprings with high economic and genetic potential. There about three epidemic livestock disease which prevail in Nkasi district, notably; New castle disease (NCD) in poultry, Contagious Boving Ploural Pneumonia (CBPP) in cattle, Contagious Copring Pleural Pneumonia (CCPP) in goats, Foot and mouth disease (FMD) in cattle and goats, East coast fever (ECF) in cattle. Nkasi district is faced with many problems pertaining to livestock development but the major ones are; Inadequate of pasture or grazing land, inadequate cattle dips, inadequate livestock Extension officers, and presence of livestock diseases. Fishing is yet another important economic activity for the rural population particularly those residing along the Lake Tanganyika shore where there is 33 Villages constituting 38% of the District population. The Lake Tanganyika is very rich in different types of fish and sardines. It is estimated that the lake has ……………. Tonnes of sardines and ……………. Tonnes of fish, unfornately, it is only …. % of this that is being fished. In addition to this, the Lake has numerous types of ornamental (aquatic) fish unique in the world which are being fished by private companies for export. However, Lake Tanganyika resources are not yet tapped to ad ribitum; the basic problems facing fishing industry are poor and inadequate fishing gears, cold storage facilities, poor road infrastructure to the market and limited internal market. The District council in collaboration with the Lake Tanganyika Regional Integrated Development Programme (PRODAP) and Lake Tanganyika Project (UNDP/GEF) 2009/2013 launched a programme of developing lakeshore areas, and one of the activities was to build improved fish landing sites and markets at Korongwe and Mtakuja villages. Completion of these infrastructures will boost up lake products markets and hence the economy of the people in the area. The district has one game reserve known as LWAFI which has an area of 2,228.4 square kilometers. The reserve has a variety of wild life ranging from lions, elephants, antelopes, leopards, uikers, zebras, hippopotamus, buffaloes, waterbucks, kudu, crocodiles and a variety of birds which are unique only to Lwafi game reserve. Tourist hunting is conducted in the reserve where by the District council gets benefit of 5% as cess adding to its annual revenue from the Ministry of Tourism and Natural Resources. The table below shows the statistic for tourism hunting revenue record in Nkasi district. Transport is the movement of people or goods from one place or one point to another, using transport medium. Transport in Tanzania is the policy introduced by the government of united republic of Tanzania in order to develop transport sector which the government categorized into air transport, water transport, road and railway transport. And these transport systems have their own establishment such as SUMATRA and TANROADS. Facility under utilization thus may be caused by either the sequence of ambition investment of lack of utilization of the guides such that some facilities are being over utilized others which provide to reduce pressure on the former are under utilize hence formation of the policies. Also, the National Information Communication Technology Policy stress Tanzania to become a hub of Information Communication Technology Infrastructure and Information Communication Technology solutions that enhance sustainable socio-economic development and accelerated poverty reduction both nationally and globally. Road transport is the predominant access mode of transport in the District as it shares traffic movement. The District council serves 1064.3 where as Region roads serves 330km and District services 698.5 km of road network of which 147 km are gravel roads and the rest 551.5 km are earth roads. Road transport is the predominant access mode of transport in the District as it shares traffic movement to the District. Some of roads are passable throughout the year but other roads are not passable during rain season especially those directly connected the district headquarters and Wampembe division. Picture2: Bicycle as a means of transport at Nkasi district. There are number of contributions made by transport system in socio-economic activities these are:- transportation of crops from farm areas to the market areas, easy transportation of patients, it support indigenous daily activities. Provision of funds to rehabilitate the road network in order to improve its quality and reduce maintenance cost, Provision of training to staff in order to improve planning and management for successful execution of the road works carried out by the council and Provision of construction equipments and vehicles for supervision of works. Telecommunication system in the Council is fairly adequate although there are areas like Kala, Ninde and Wampembe Wards which has no telecommunication Networks. Recently there has been a lot of improvement in this sector. Communication companies like TTCL has been in operation for a long time in Nkasi District Council. Nkasi District council has got a wide coverage of telecommunication system by 4 companies in operations; these are TIGO, VODACOM, ZANTEL and AIRTEL. Also there is one Landline telephones by TTCL. Radio telephones calls are also wide spread and operated by Health facilities (8) and one postal services. By and large, all means of communication is very helpful in facilitating handling emergences occurrences of patients in need of referrals to Namanyere Dioceses Hospital. Postal services, radio calls, Radio station (Nkasi FM) and telefax services are also available. Internet service cafes have now slowly started following the provision of electricity services in the Council especially at the District Headquarters. Communication network contributes in expanding the size of the market such as small business activities. Here below are some of the objectives and gap of the national transport and communication Policy (2003). Gap: The existing transport infrastructure is characterized by deteriorate transport infrastructure. 2.6.6 Problem concerning road networks in the district. Land is a part of the physical environment characterizes by cyclic and non cyclic attributes that can be predicted constituting climate, relief, soil, vegetation and hydrology to the extent that influencing potential for land including results of past and present human activities. Land is the most important resource to human since it supports about 95% of socio economic activities performed by all human. These activities are like agriculture, fishing, settlement, business, transportation and livestock keeping mentioning but few. Accessibility of land to all people, members of the community in Nkasi district is by inheriting it and being distributes by the village government. Land is utilized by the community in farming activities, livestock keeping and settlements. It contributes to most of the community production especially in cash crops where they produce, example, tomatoes, millet and maize, normally the community members participate in the land management practices especially afforestation programs. Since Tanzania attained political independence in 1961 there has been the need to have a comprehensive land policy that would govern land tenure land use management and administration to have new national policy. Consultation and consent of a village council will be required whenever alienation of village lands are necessary. Residential areas, commercial and industrial land will be allocated in a transparency manner such as open tender or auction. All citizens shall have equal and equitable access to land. In the case of local companies, priority shall be given to those who majority share holders are citizens on accessibility of land. A dual system of tenure which recognizes both customary and statutory rights of accuracy as equal in law will be established. A right of occupancy as a title to the use of occupation of land shall be confirmed by a certificate of title for the statutory right of occupancy. Customary right of occupancy will be confirmed by “Hati ya ardhi ya miliki” which will be issued by the village council and registers at corresponding districts land registry. The villagers are not involves in land alienation and there is no consultation and industrial land. It shows that there is no transparency in all activities of land alienation. In other case the government not yet set aside especial areas for investors. No identified allocation for various investments and special areas done by the government. Also there are people who own more hectares of land than others. No identifiable allocation for various investment and special areas done by the government. In present situation, the priority is given to local companies and citizens are ignored. People in Nkasi district council are not aware of a dual system of tenure which recognizes customary and statuary rights. In other case, many indigenous have no certificate of title for the statutory right of occupancy while customary right have by “Hati ya ardhi” so there is no confirmed certificate right of occupancy or Hati ya arch. Land scarcity, Poor participation of the community on the land discussion making and Bad land use practices. Evidence from mining exploration and survey indicate the presence of mineral deposits in the district which are unexploited. These resources are left unexploited due to lack of proper technology and capital. To date local miners are extracting the resources with poor indigenous technology.